Recently I attended the first-ever MegaCon Fan Days, and I made two excellent contacts then that turned into interviews I’m sharing during this episode! First up is James Haike, creator of the excellent independent comic Solar Flare. During our chat, he discusses what inspired him to write this comic, how he assembled the team (including Branko Jovanovic, Song Ye and Michael Legace) who’s bringing it to life and what we can expect to see from them in the future! I’m a big fan of this title, so I strongly recommend that you support James’ current Kickstarter campaign like I have! You can also purchase the individual issues at their website, so don’t miss out! To view the video about the series we discuss during our conversation, go to this link! Then I conclude this episode with a brief chat with Tim Townsend, who’s working on Marvel’s new Doctor Strange comic with Jason Aaron and Chris Bachalo. He talks about what he does to make this great book happen, and tells us a little about the various characters in the Sorcerer Supreme’s life we might or might not see again soon! Brent is no longer solo as his buddy Jim Efantis joins him on this special edition of BK’s Bullets! Jim is relatively new to comics, so Brent discusses his likes and dislikes with what he has been reading recently. Jim is also an avid video gamer, so they discuss the new Microsoft Store, upcoming games, digital exclusives, cross-play on Playstation and much much more! If you like what Brent and Jim have to say on Comics OR Video Games, let us know on Facebook! And we will do more! The rumors of my demise are greatly exaggerated. 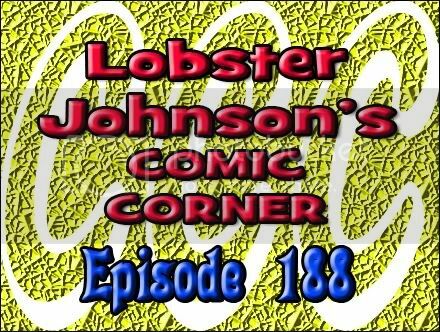 Lobster Johnson hijacks my show as I nurse the hangover from hell. His Pick Of The Week goes to Mark Waid & Marcos Martin for Daredevil #5 (Marvel). Fast Five picks include Incredible Hulk #1 (Marvel), Journey Into Mystery #630 (Marvel), Captain Swing & The Electrical Pirates of Cindery Island #4 (Avatar), Secret Avengers #18 (Marvel), and Wolverine & The X-Men #1 (Marvel). Spoilers! V for Vertigo, Episode 109: My Last Kotei? I lack energy this week and my voice is gone because of the San Jose kotei. As much fun as I had, it may be my last one. I talk about it and me taking a break from the collectible card game, Legend of the Five Rings. I go over some old school Vertigo by covering Shade, the Changing Man: The American Scream (Peter Milligan, Chris Bachalo, Mark Pennington) without me screaming. It’s not as outdated as I thought it’d be, but it’s way more trippier than I thought it’d be. On this weeks very exciting show we do something altogether new for us. We review a book the week before it ships. It is not just any book either, it is one of the hottest independent titles in the country right now! This book, of course, is Chew #3. We also review JSA #29, this is the one where Bill Willingham, Matt Sturges and Jesus Morino take over as the new creative team. Last but not least we take a look at The Sinister Spider-Man from Brian Reed and Chris Bachalo. There is much discussion about the happenings at last weekend’s San Diego Comic-Con. Music by The Dropkick Murphys, Wall of Voodoo, and Mushroomhead.